Rowsell sails offer a comprehensive sail repair and valeting service! We can add UV protection to tired Genoa’s or replace existing old sacrificial strips, old canvas, sprayhoods, dodgers can be restitched, sails can be cut down in some cases, new luff ropes , extra reefing added almost anything is possible! 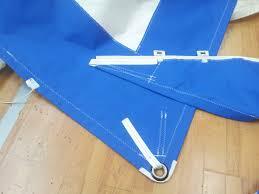 Our Standard sail repair and Valeting services. Loft charging is £30 per hour on repairs outside of the above.